As always.. we lack flat land, so our options were limited for what to do with the grey water we captured. So we decided that the best option was a layered filter pond set in to the hill below the house near the orchard. 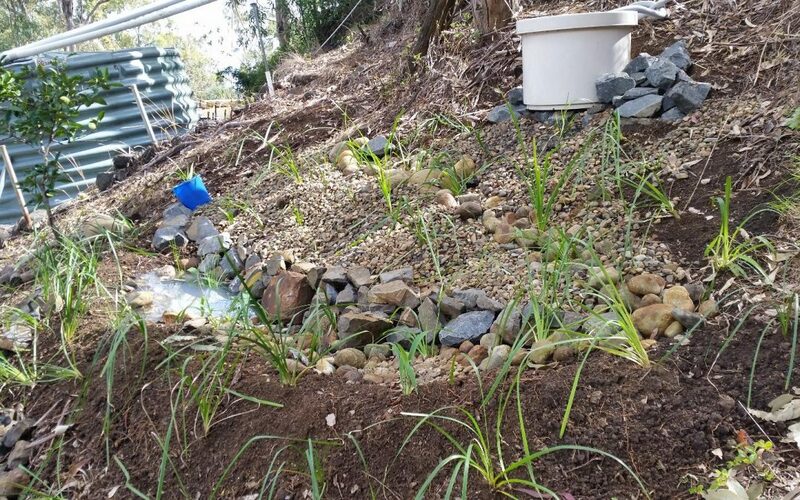 Building a ‘pond’ on highly sloping ground presented some challenges, but after a bit of planning and thinking we worked out a fairly simple and easy to build solution. Below is a pic of the area we chose. Yep, it’s steep… and also heavily infested with Singapore Daisy. But it did offer us a way to ‘water’ the Orchard that is just below this area by utilising the grey water once it is filtered as much as possible. The plan was to build a set of ponds or at least a running area that lead to a main pond. Our intention was to get the grey water to flow from one level to another through various gradients of material and then to collect in the bottom main pond. We had a ‘container’ that was going to act as a reservoir at the top of the filter system. This would hold the majority of the grey water when the pump ran and and pumped out the main reservoir near the house. We reuse and recycle whenever we can, and our reservoir for the grey water filter system was a great piece of re-use. It is the base of a plastic table setting that could be found on the deck here at Arborlon(Bundaleer) for the last 10 years plus. I have photos of it from back in 2009-10, and I shared a cup of tea with one of the previous owners at this very table. It was a nice touch to be able to reuse it in a way that improves the property. The Filter Pond reservoir was dug into the hill and supported by blue stone. The area in front of the reservoir was cleared and ‘sculpted’ into a winding path down the hill. 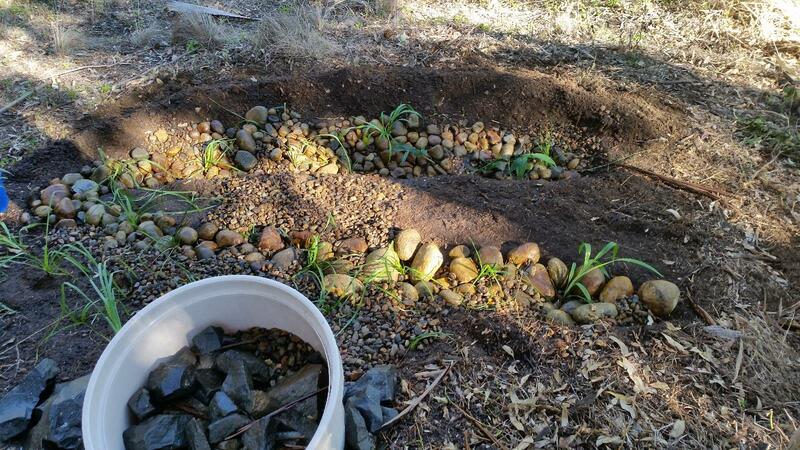 We started filling the first level of the filter pond with “River rocks” and small pebble gravel. These are also reused and recycled resources. 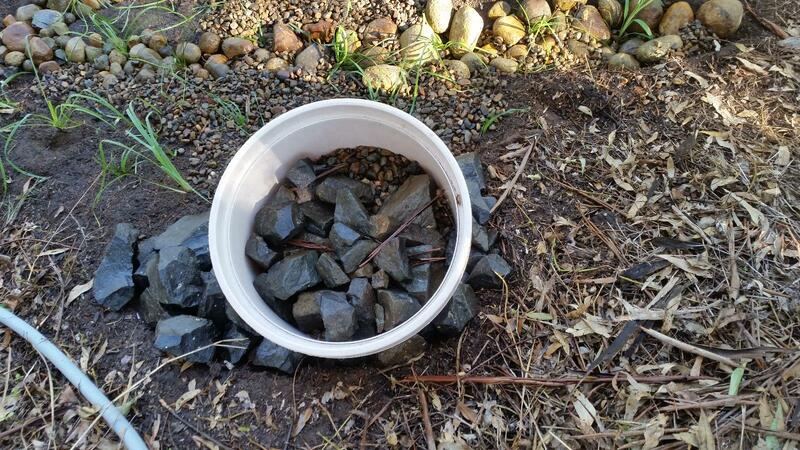 The larger River rocks we get from the road and the smaller pebbles are from the gardens created by previous owners. Rain and erosion regularly cause rock falls across our road and we often collect the displaced rocks for various uses around the property. 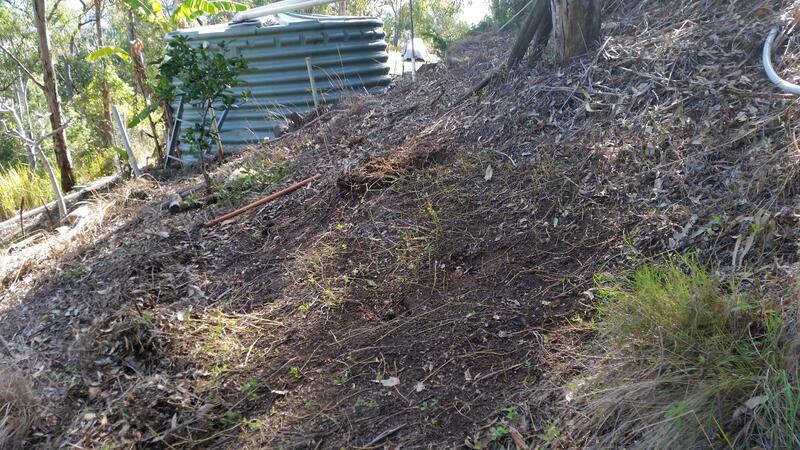 Erosion control, retaining walls, rock drains, Creek erosion control and many other things. The “River rocks” we used in the Grey Water Filter Pond are found here along our road. They are smooth rocks from a river bed that are most often oval or circular in shape. Interestingly we are at about 400 m above sea level, and there are no rivers here. So these rocks are most likely from a river that ran here long before the erosion created the mountains and valleys. We can see them in various geological layers as you go up the mountain. River rocks on a mountain at 400m… just one of the interesting bits of geology here around the Scenic Rim. 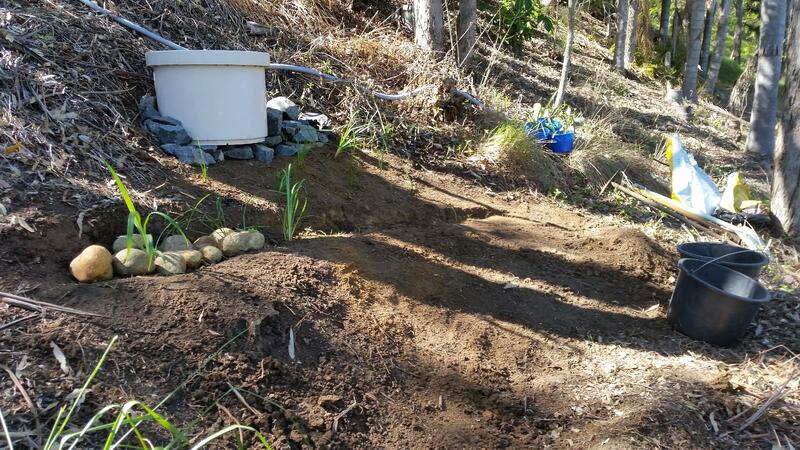 One of the most important parts of the Grey Water Filter Pond is the planting. We needed plants that could survive and thrive in the grey water environment. There are various chemicals and products that end up in grey water and the biggest issue is usually salt from the various detergents and soaps that we use in the house. So we needed salt-tolerant plants and plants that thrive in a damp/watery environment. We decided on a combination of plants, some that we knew would be successful in the grey water environment , and others that were an experiment. Plants were added at all levels and in all running areas. 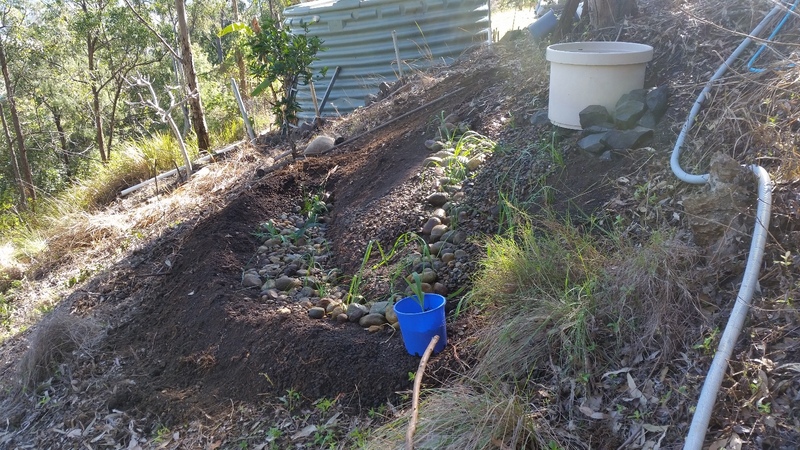 Lomandras form the bulk of planting and the Juncus and Native Ginger were used in the main filter pond. Blue Flax Lilys and Saw Sedge were placed various places through the system. 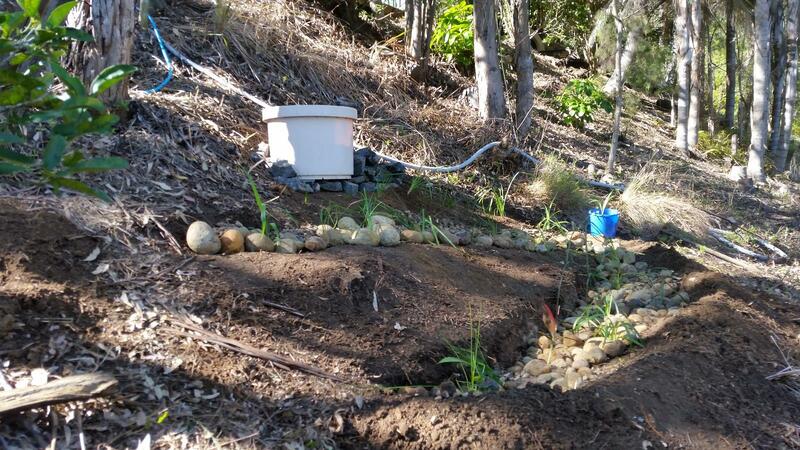 We placed more rock and gravel through the filter pond until most areas were filled and we planted the areas as we went. We also tested water flow a number of times to see where the grey water would flow to, and if our planning and excavating was captured all the water flow. Once planted out and secure with the rocks, gravel and pebbles available we were really happy with the outcome. All seemed secure, and flowed well. We adjusted our Grey Water pump to pump more often, and at smaller volumes so that we could manage the rate of flow into the filter pond. We have more work to do be the basics are in place and working well. Will update as we finish the project.